A happy accident occurred in our kitchen this past weekend. And it’s one that turned out to be quite pretty. Take a look. I’ll admit, when I started, I had no idea where the dish was going to end up. All I knew was that I had some big, beautiful beets and I was going to make something with them. I started by roasting the beets along with some radishes (you know how much we love those now) and then just started pulling other additions from the pantry. The result was a bright, beautiful couscous salad. The beets tinted everything a lovely shade of pink that really helps this dish pop aesthetically. The pepitas add an unexpected crunch and the caramelized shallots add a nice sweetness. I definitely recommend you give this one a try. 1. Preheat oven to 375°F. 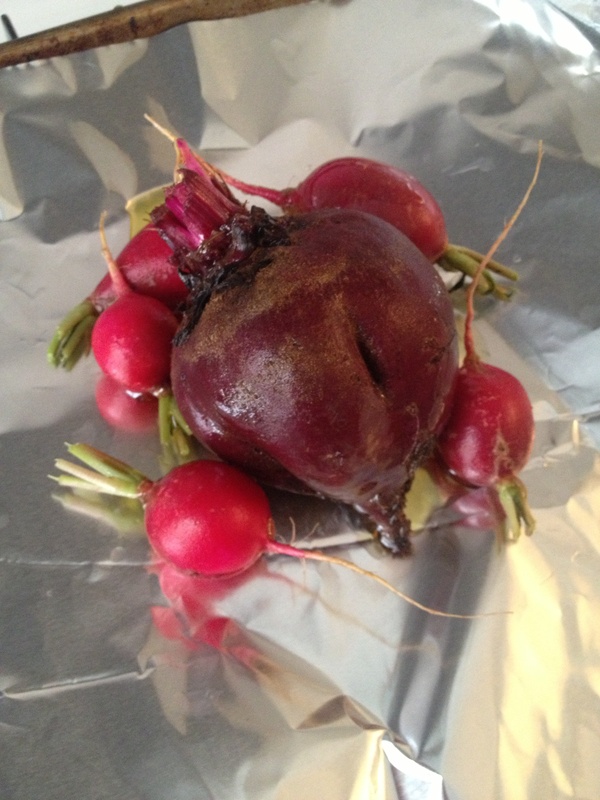 Place the beets and radishes on a piece of foil and top with 2 tablespoons olive oil and a sprinkle of salt. Fold the sides of the foil up and secure. Roast for 60 minutes, then remove from oven and let cool. When beets are cool to the touch, use your fingers (wear gloves to prevent staining your skin) to remove the skin and discard. Dice the beets and radishes and set aside. 2. Meanwhile, prepare Israeli couscous according to package directions. Once made, let cool to room temperature. 3. Heat a small pan over medium-low. Add the butter and let melt. Add the shallots and cook, stirring occasionally, for 10 to 20 minutes or until caramelized. Transfer to a paper towel-lined plate and set aside to cool to room temperature. Once cooled, roughly chop and set aside. 4. 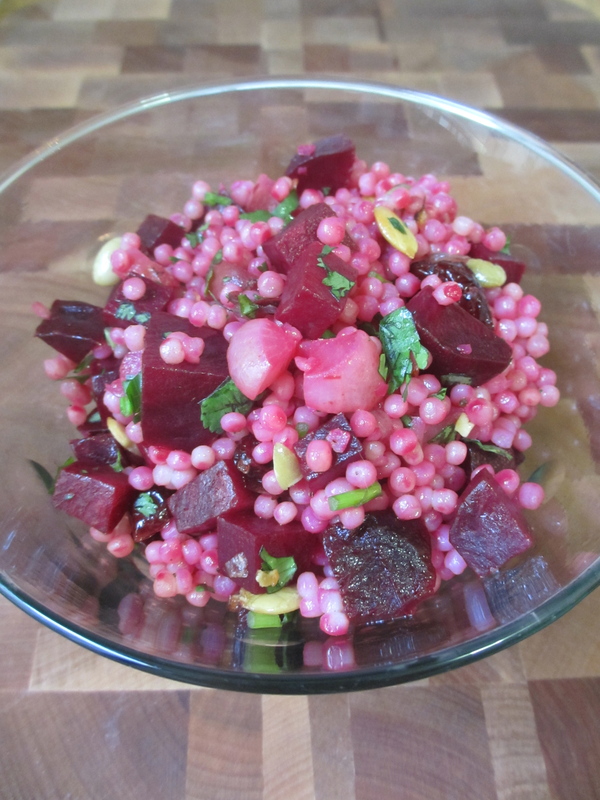 In a large bowl, combine the beets, radishes, Israeli couscous, shallots, pepitas, dried cranberries and the parsley or cilantro. Top with the fruity olive oil and red wine vinegar. Toss to coat. Add salt and pepper to taste. SWWU Tip 1: I found that this salad tastes best at room temperature. If you refrigerate leftovers, just bring to temperature on the counter 30 minutes prior to serving. SWWU Tip 2: Don’t have one of the ingredients on hand? Replace the pepitas with walnuts or almond slivers. Swap golden raisins for the dried cranberries. Use fresh min instead of cilantro or parsley. Play around a bit and have some fun. 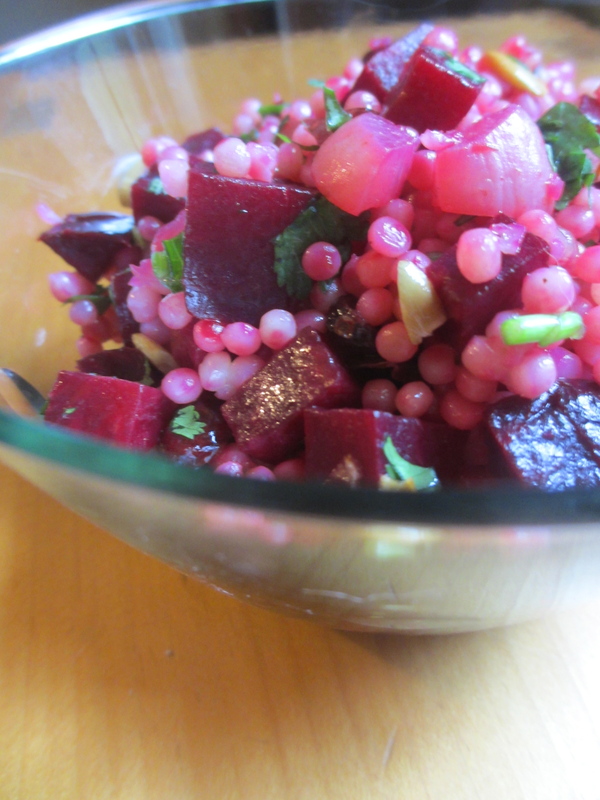 This entry was posted in In the Kitchen and tagged @SWWUblog, beet, caramelized shallot, colorful, in the kitchen, israeli couscous, picnic, pink, radishes, recipe, roasted beets, side dish by Something We Whipped Up. Bookmark the permalink.